The Zebra DS8178 Barcode Scanner offers you an extremely high performing mobile 1D/2D area imager with an 800 MHz processor. 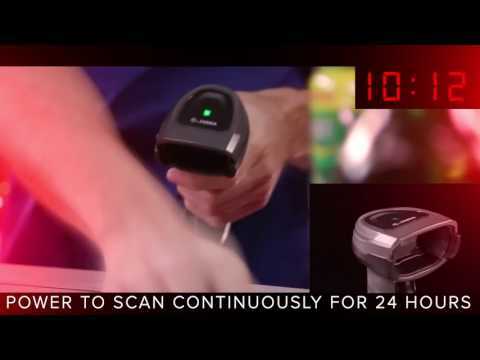 The high-performance scanner also reads dirty, faded and problematic bad quality barcodes from a distance of up to 61 cm in a matter of seconds (even from a smartphone display), thanks to the integrated high resolution sensor and Zebra's PRZM technology. Bluetooth 4.0 provides a continuously reliable connection with any Bluetooth-capable computer, smartphone or tablet - up to a range of 100 m. Zebra's Wi-Fi friendly mode prevents interferences between the scanner and the WLAN connection for both employees and customers. In addition to all classic 1D and 2D barcodes, the DS8178 also supports digital watermark barcodes, respectively Digimarc barcodes. These barcodes are invisible to the human eye and are spread all over the product packaging. There is no need to turn the article, since the DS8178 can read the barcode in any direction. Thanks to Zebra's free-of-charge remote software SMS (Scanner Management Service), you manage and configure the DS8178 and many other models worldwide from a PC, smartphone or tablet. High-performance Bluetooth area imager for 1D/2D barcodes in retail. Reads invisible Digimarc barcodes in a matter of seconds. Reliable connection up to a range of 100 m, thanks to Bluetooth 4.0. Captures entire DIN A4 pages too, thanks to high resolution camera. 14 hour Battery Life with PowerPrecision Plus Battery. Requires: Interface Cable, Charging/Transmitter Cradle, Power Supply Unit and Power Cable, all available in accessories. Bluetooth scanner, 2D, imager (standard range), FIPS, protection class: IP42, Black. Includes: Scanner (DS8178-SR0F006ZMWW), Presentation Charging/Transmitter Cradle (CR8178-PC100F4WW). Requires: Interface Cable, Power Supply Unit and Power Cable, which can be found in accessories. Includes: Scanner (DS8178-SR0F007ZZWW), Presentation Charging/Transmitter Cradle (CR8178-PC100F4WW). Includes: Scanner (DS8178-SR0F006ZMWW), Charging/Transmitter Cradle (CR8178-SC100F4WW). Includes: Scanner (DS8178-SR0F007ZZWW), Standard Charging/Transmitter Cradle (CR8178-SC100F4WW). 1.8M, three wire, grounded BS1363 plug. Zebra RS232 cable, 7 Ft. (2 m), TSD on 2. Zebra Connection cable, USB, shielded. Power supply used with MC50, MC1000, four slot cradles and MC55, MC55A0, MC55A0-HC, MC70, MC75, MC3000, MC3100, MC90XX, MC9190-G, WT4000 and MC75A single slot cradles.